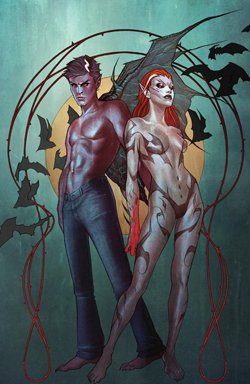 Vampires exist in the DC Universe. Andrew Bennett is a vampire who believes they can co-exist with humanity, mainly by staying under the radar. His ex-lover, Mary, Queen of Blood, believes vampires should not try to co-exist with the human… livestock; vampires should rule them. Needless to say, this puts these two lovers at odds with one another. We catch up with them as Mary is making her declaration of war and Andrew is trying to get her to reconsider. Andrew doesn’t doubt his convictions about vampire-human relations, but you know that losing Mary has broken his heart. Mary is a fantastic… I don’t want to say villain… let’s say counterpoint to Andrew. Mary is tired of being viewed as a second-class citizen and you understand her justification for what she is doing. What impresses me most about this book is its efficient storytelling.Writer Joshua Hale Fialkov shows us everything we need to know about Andrew and Mary and their… complicated relationship. He opens the book with a conversation most writers would make us wait five to six issues to see. Even though we are just meeting these characters, the intimacy of the conversation tells us everything we need to know about them. We immediately know the stakes (pun unintentional) not just for the world, but for Andrew and Mary. Considering most first issues have a hard time introducing one main character, the fact that we are effectively introduced to two is quite the accomplishment. I was very impressed with Andrea Sorrentino’s beautiful and haunting artwork. It’s very reminiscent of Jae Lee in all the right ways. Sorrentino’s line work is maybe even a little tighter. Colorist Marcelo Maiolo gives the issue a really beautiful palette. Seriously, the artwork in this issue is positively stunning. I, Vampire is not just one of my favorites of DC’s “New 52,” it is hands down one of my favorite issues of the year. This is the second time Josh Fialkov has made that list this year (the first time was with Echoes). I hope the book finds the audience it deserves. It has given us two very rich characters who love each other but are clearly destined to hate each other. That my friends, is a great conflict to base a story on. Check it out; I look forward to hearing what you think about it.